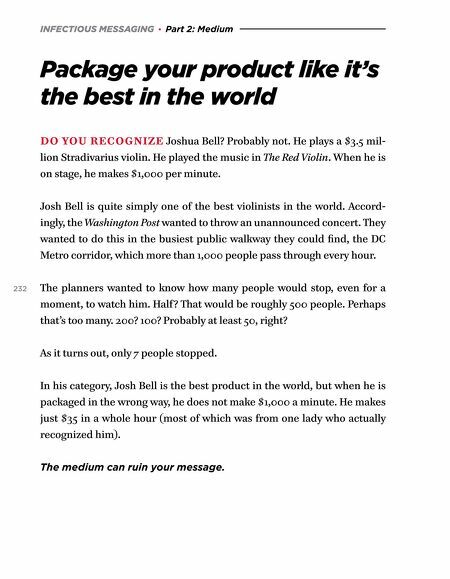 INFECTIOUS MESSAGING · Part 2: Medium Package your product like it's the best in the world DO YOU RECOGNIZE Joshua Bell? Probably not. 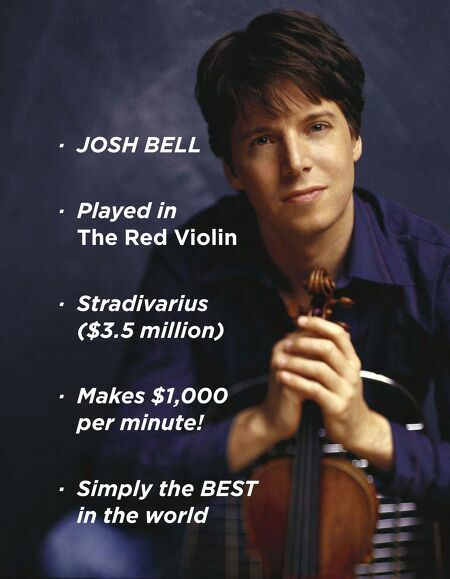 He plays a $3.5 mil- lion Stradivarius violin. He played the music in The Red Violin. When he is on stage, he makes $1,000 per minute. Josh Bell is quite simply one of the best violinists in the world. Accord- ingly, the Washington Post wanted to throw an unannounced concert. They wanted to do this in the busiest public walkway they could find, the DC Metro corridor, which more than 1,000 people pass through every hour. 232 The planners wanted to know how many people would stop, even for a moment, to watch him. Half? That would be roughly 500 people. Perhaps that's too many. 200? 100? Probably at least 50, right? As it turns out, only 7 people stopped. In his category, Josh Bell is the best product in the world, but when he is packaged in the wrong way, he does not make $1,000 a minute. He makes just $35 in a whole hour (most of which was from one lady who actually recognized him). The medium can ruin your message.